As I mentioned in an earlier blog “The Sacrifice of 3 Days”, I have plenty of time for other opportunities. I sometimes take a ride down to Belle Isle early in the day. It”s not crowded like it is on the weekends. Still plenty of people come down to enjoy a multitude of outdoor activities. Joggers and walkers are the first to greet the island in the morning. I won’t get there till around noon. I always park my van on the west side of the island, closest to the water. 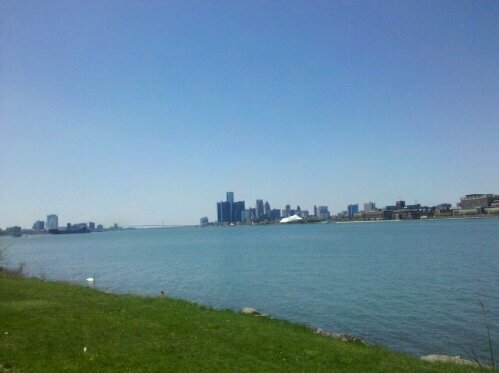 This is the best view of the Renaissance Center in the city! Whether you call it the Ren-Cen or GM Building, It is a spectacular sight towering over shimmering blue water. I often sit there and come to the realization that I wouldn’t want to live anywhere else! Las Vegas included regardless of how many times I go! Now it’s off to Coney Island for chili fries with cheese! For the record, I do not make a habit out of eavesdropping but I overheard a conversation that rattled me a little. So I put my fork down and listened for a minute. This guy heard about possible plans to charge people a fee to gain access to Belle Isle. He was clearly not happy about it. He felt that Belle Isle should always be free. I can’t really argue with him there. Keeping Belle Isle free to the public has been one of the things that has helped the island keep its charm all these years. It is easy to load your family and friends into a car and enjoy yourselves free of charge. His next point turned my dial in the negative direction.”They need to put some more money into it before I pay to go on it. Some of that stuff is terrible out there.” He was right about the appearance. Tops on my list is the old Belle Isle Zoo. The zoo lays there like an old house of horrors. Haunted by the echoes of animals long gone and decorated in slowly rotting wood. I guess the city’s plague of empty buildings has infected Belle Isle too. The old Aquarium is evidence of that as well as the zoo. The Belle Isle Aquarium was home to some of the rarest fish in the world. Also, it was the oldest continuously operating aquarium in North America until its closing in 2005. I liked this place a lot. Going there inspired me to have fish tanks of my own! I liked the Electric Eel the most! They had a light bulb rigged so that it would glow whenever the eel put out a charge! Coolest thing I ever saw as a kid! I hope it could be brought back! That’s why we should absolutely pay to get into the park! The best resource to pump life into the island is the people who enjoy the island. I don’t believe that the public would oppose, if the money made from an entrance fee was 100% invested into the island. I sure wouldn’t mind at all. It could serve as a living symbol of what this city can achieve when everybody kicks in. Hopefully it can be contagious. Yes ladies! New bathrooms! We could also rebuild the Belle Isle Zoo or draw a chalk outline around it and throw it in a body bag in favor of something new. Don’t see it yet? Here’s what you do. Go to Belle Isle on a beautiful Saturday afternoon. It’s going to take you a while. Traffic gets thicker the closer you get. You can start counting cars a quarter-mile away. Trust me you will have time, you are only going to be moving at 2 miles an hour. If you find a place to park, get out and start counting the cars. If you could not find a place to park, riding through works also. You can stop at any time. Now multiply that by…Let’s say $2 a car. Now multiply that by the hour, then by the day, for 2 1/2 days. This accounts for Friday night, all day Saturday and Sunday. Then times 12, representing the weekends of June, July, and August. I know the weather may claim a few days out of the equation but you would have a rough estimate of how much money could be brought in annually, at the least. Now think about what you could do with that money. Get the picture now? It could reduce the effect the island has on the city’s debt at the very least. After you read this blog, go to Belle Isle and look around for yourself. Imagine how much better the island would be if the money were available for much-needed improvements. Picture in your mind, people coming from all over to enjoy the new and improved Belle Isle. Paying their way to help maintain this new and improved Belle Isle. Better yet…imagine the satisfaction you would feel knowing that you contributed to getting it all started. If you want to know more about Belle Isle, including tons of interesting facts that I never knew until now, check out the Friends of Belle Isle website at www.fobi.org Holla if you hear me! Posted on June 9, 2011 by KELLY GREENE	• This entry was posted in Places. Bookmark the permalink. Mr. Greene, I could not agree more. Every other park charges, so why not Belle Isle?? the potential for this island to much more then just a weekend spot is tremendous……i think that was made more then apparent when we hosted the car races! !…..imagine if the proceeds collected could bring back the State Fair or perhaps the city could reopen the zoo….not to mention the notion of having our own amusement park! !……..in a nutshell, the ideas are unlimited. First of all, Thank you for reading! Yes the possibilites are indeed endless but I would like to see the revenues solely put back into the park for at least 10yrs before we explore sharing the wealth with the rest of the city. Thanks for commenting! Kelly, I agree totally, It is a shame what Bell Isle has become, and $2.00 is a small price to pay to have it restored to some of it’s former glory. I remember the fountain, the aquarium, and the zoo fondly. And lets not forget the canals where you could rent a canoe for a few hours of plesant travel around the park. Yes, $2.00 is a very small price to pay to bring back those memories for the ones that remember them, and to install new ones for the those who never saw the island from years ago! I am trying to get more people to see that David. The young folk especially. Thanks for reading!